"With my limp, walking will t-take a very long time..."
A visit to Oz will bring with it the requisite sense of wonder and amazement. There are plenty of interesting characters to interact with, fascinating ares to explore and a general discord here and there to make for fun storytelling. Legends of Oz: Tik-Tok and Kalidah #1 from Aspen Comics delves into that universe by looking at some of the aforementioned characters and settings. The issue is written by Rob Anderson, illustrated by Renato Rei, colored by Ceci de la Crus and lettered by Josh Reed. Anderson jumps right into the story as far as Tik-Tok goes, throwing him the thick of things without hesitation. It's a very effective approach for characterizing him as an individual supremely confident in his abilities--both negotiation and gunplay. The rest of the issue plays out as a chase of sorts, with the Wicked Witch's winged-monkey cronies tracking Tik-Tok down for the same treasure he seeks. The dialogue is pretty straightforward and works well at laying out the stakes and path for the characters to follow, but there's not really much of a frenetic sense to the "chase." Anderson does a pretty solid job otherwise though, effectively presenting a slight twist on the treasure that will make things further interesting as the series progresses. 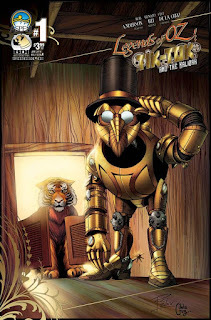 The artwork in Legends of Oz: Tik-Tok and Kalidah #1 is a strange mix of fantasy and surrealism. Rei gives plenty of attention to Tik-Tok, articulating him as a well-oiled machine (no pun intended) who's more than capable of holding his own. Human characters are rendered more on the realistic side, providing the book with characters who are on the other end of the spectrum and come across as very real looking. The tiger who runs with Tik-Tok looks a little strange, in that Rei illustrates his head in a way that seems disconnected from his body (the flying monkeys actually look like a good blend of the two species). The colors by de la Crus are vivid and live in the primaries, effectively adding one more level of differentiation amongst characters. Legends of Oz: Tik-Tok and Kalidah #1 doesn't feel like an Oz story on its surface, but there are enough tie-ins to the main universe for it to work. Tik-Tok is an interesting extension of the mythology that accompanies the land of Oz and it seems as if things will get tougher for him before they'll get easier. Anderson's script is pretty cut and dry, moving characters from one point to the next while others are in pursuit. Rei's illustrations are effective at capturing the widespread nature of Oz, proving that there's more to the kingdom than just the Emerald City. Legends of Oz: Tik-Tok and Kalidah #1 will appeal to fans of the property looking for a new corner of the universe to explore. Legends of Oz: Tik-Tok and Kalidah #1 is in stores April 20.